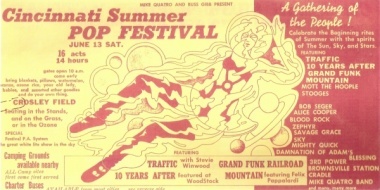 Awhile back, the hardreminiscing staff waxed nostalgic about the Cincinnati Summer Pop Festival of 1970. On the Saturday afternoon of June 13, 1970, a documentary was playing at the air-conditioned Albee Theatre on Fountain Square in downtown Cincinnati. It was the film Woodstock, which depicted the coming together of a new generation of Rock fans and Rock musicians. On that same humid afternoon a similar music gathering was happening just a couple of miles away. The Cincinnati Summer Pop Festival didn’t take place on a farm, but rather at a ballpark in the West End. At Crosley Field, home of the Cincinnati Reds since 1912, 14 Rock bands played a daylong festival. With new bands like Grand Funk Railroad, Alice Cooper, Bob Seger, Mountain and Iggy Pop and the Stooges, the performers didn’t reflect the Age of Aquarius but of what was coming for Rock music in the new decade of the 1970s. I was at the Cincinnati Pop Festival the police were anything but congenial. It was a little more than a month after the Kent State Massacre. There were skirmishes outside on and off all day. Police cars were overturned and torched. The concert set up was the stage was in the outfield and the Cincinnati Reds didn’t want the audience on the field. There were give and take fights for the turf and the audience eventually won the field. If the audience hadn’t stolen the field there would have never been the footage of Iggy and the Stooges with the audience. Also that the end with Traffic the Cincinnati Police lined up in front of the stage and tried to one step forward, one step forward the audience out of the ballpark. It rained bottles and cans on them the front line put up their batons only to cause shard of glass to pelt the line behind them. It wasn’t pretty. The hippies who got arrested for drugs sales in and out of the venue all exchanged their clothing while in a holding cell. The cops couldn’t identify anyone from their reports and they were all released with no charges. The music was awesome but the day wasn’t as congenial as painted in this article. Makes the hardflinching staff glad we stayed in the stands that night. This entry was posted in Uncategorized and tagged 40th anniversary, Alice Cooper, Bob Seger, Brian Powers, Cincinnati Summer Pop Festival of 1970, Cincinnati's City Beat, Crosley Field, Grand Funk Railroad, Iggy Pop and the Stooges, Mountain, Traffic, Wayward Bill Chengelis. Bookmark the permalink. Those heady days may be gone, but at least they managed to elect a vice-president from their party.